Rangers chairman Malcolm Murray says claims by a former bid advisor that they could return to administration are out of date. Jon Pritchett, who advised American tycoon Bill Miller, made the claim in top business magazine Forbes. 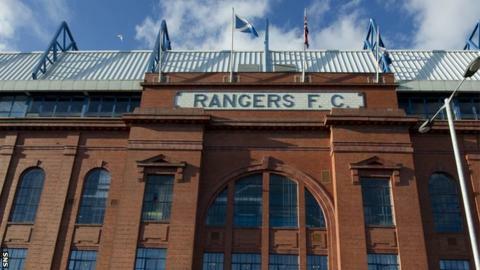 But Murray said: "The last time he had sight of any financial information about Rangers was many months ago. "And, as a result, his article in Forbes Magazine is ill-informed, misleading and scaremongering." Pritchett said that Rangers needed a combination of a culture change and severe cost cutting to avoid a repeat of the financial problems that led to the old company falling into liquidation. But Murray insisted that the consortium led by chief executive Charles Green - and created a new company with its team now in Division Three - was tackling the historical problems highlighted by the former bidders. "For the avoidance of doubt, there is no risk of the club going into administration and any suggestion otherwise is scandalous and appears written to attract headlines," said the chairman. "Projections Mr Pritchett had sight of have not been relevant since May and, from the day I became chairman, I have been committed to ensuring this club lives within its means and never again comes to the brink of collapse. "We have already secured significant investment in the club from the individuals and organisations who are part of our consortium." Murray said that a planned share issue will also "generate many millions in additional revenue" later this month. "It does not take a genius to work out that costs needed to be cut at the club and this has happened, with the first-team wage bill being reduced significantly," he said. "However, we also have a plan to maximise commercial revenues and develop many areas of the club that historically were under utilised." Murray insisted that Green's bid was a better option than Miller's. "It is my understanding that Mr Miller's plans were based purely on cost cutting and little additional investment in the club," suggested the chairman. "What is also clear from his article is that Mr Pritchett completely underestimated the loyalty and commitment of the Rangers fans. "In addition to the 36,000 season ticket holders so far this season, the attendances at our home matches have surpassed many of the top clubs in England and the rest of Europe." Pritchett said Miller had decided not to acquire Rangers because "the numbers just didn't add up", with a projected loss of £10m in 2012/13. "If Charles Green is not willing to face the fans, explain the economics and risk the torrent of abuse that will follow in the short term then Rangers will find themselves shortly back in the same place," said the chief executive of Chicago-based sports investment firm Club 9 Sports. "Unless some major, systemic changes occur within the current configuration of UK and European football leagues, I don't think the Rangers math works. "The club can't afford to pay its manager over £1m and then give every coach and executive premium healthcare, generous pensions, six weeks of vacation, exotic cars, free fuel, appearance fees and other perks." In addition to also dispensing with "expensive past players" who do not bring professional skills to the table, Pritchett advised that the coaching structure must change to place an emphasis on developing the club's own young players. "This can only be done by embracing a methodology that employs metrics, science, training, teaching and coaching," he added. "This requires a manager with experience and relationships well beyond western Europe."